And he was right. In the months leading up to EDSA Dos, the movement to oust Estrada was led mainly by Bagong Alyansang Makabayan and the groups affiliated with it. It was BAYAN that held regular rallies to Mendiola, just outside Malacañang, and had been harassed and arrested by police for their troubles. It was BAYAN that remained ideologically pure despite loose alliances with more moderate civil society groups. 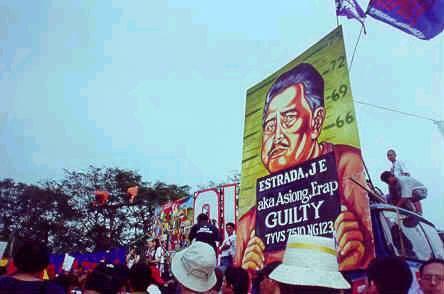 The call was clear: Estrada needed to be booted out of office and charged with plunder. 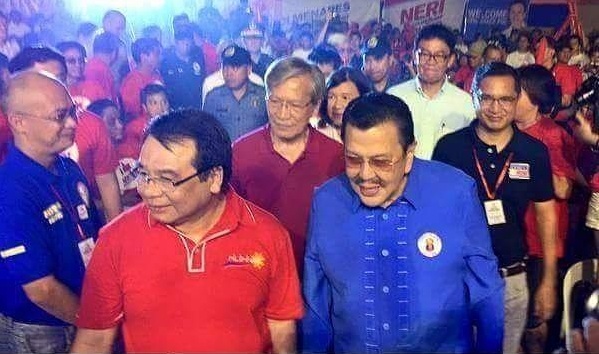 Which is why it is disconcerting that earlier this week, Estrada — since jailed then convicted for plunder and then swiftly given amnesty — was among the endorsers invited to an event to announce Bayan Muna Rep. Neri Colmenares’ run for the Senate in 2016. “Past is past. The weak cannot forgive, but forgiveness is the attribute of the strong. I always forgive. I want to remain strong,” Estrada told the media after the event. And that, of course, is his prerogative. He is a professional politician with as much influence, if not more, than when he was president and BAYAN — including Colmenares, presumably — was planning protests against him. Or last month, when a BAYAN-backed market vendors’ association declared a “market holiday” in protest of a Manila city government plan to enter into partnerships with private firms to upgrade the city’s public markets. The bigger question, and one that has yet to be asked, is why the Makabayan bloc, which is composed of party-list groups under BAYAN, accepted Estrada’s endorsement, or indeed, even thought it was a good idea. The mayor joked that he ordered the expedited renovation of Wednesday’s venue in time for Makabayan’s convention. Earlier this year, BAYAN-affiliated Anakbayan took potshots at rival leftist party Akbayan for working with the administration of President Benigno Aquino III, whose family owns one of the largest haciendas in the country. This devious publicity stunt is also meant to conceal the fact that Akbayan itself is allied with the chief representative of the landlord class who is no other than BS Aquino himself. It is Akbayan that has made the pact with the devil himself, the scion of one of the country’s most despotic landlord families notorious for the 1987 Mendiola massacre and the 2004 Hacienda Luisita massacre of protesting peasants. And Anakbayan had a point then. Not so much now. By accepting Estrada’s endorsement — if not actual allying themselves with him — Makabayan and BAYAN have lost the higher ground to dismiss Akbayan as “haciendero puppies” and “fake leftists”. So much so that even alternative news website Bulatlat downplayed Estrada’s role in Colmenares’ proclamation rally. There are no pictures of him in the Bulatlat story on the event, and his name was mentioned last. Apart from fellow lawmakers from the Makabayan Coalition, Colmenares was endorsed by Senators Grace Poe and Francis Escudero, who both earlier announced their bid for president and vice president, respectively. Isabela Rep. Giorgidi Aggabao, who is also the Nationalist People’s Coalition president, was among those who joined the convention to endorse Colmenares, along with ousted president and now Manila Mayor Joseph Estrada. When the Makabayan bloc allied itself with traditional politicians for the 2010 elections and again for 2013, it was justified (terribly) by the maxim that politics is addition. This is true, politics is addition, but for whatever BAYAN and Makabayan may gain from this odd alliance, they may have lost a lot more.